On the day that the UN Intergovernmental Panel on Climate Change (IPCC) warned that we only have 12 years left in which to prevent climate catastrophe, an American climate economist cited heavily in the IPCC’s report has been named one of the two winners of this year’s Nobel Memorial Prize for Economic Sciences. William Nordhaus, a professor of economics at Yale, has been recognized by the Royal Swedish Academy of Sciences for his work – dating back to the 1970s – in understanding and modelling how the global economy and the climate interact. Nordhaus shares the $1 million Nobel prize with Paul Romer – a professor at New York University’s Stern School of Business – who has won for his work demonstrating the fundamental importance of internal factors, such as technological innovation, in driving a nation’s economic growth. Together, the Nobel Committee says, the two laureates have “designed methods that address some of our time’s most fundamental and pressing issues: long-term sustainable growth in the global economy and the welfare of the global population”. Nordhaus began his work on climate change in the 1970s, when the evidence of manmade global warming had begun to emerge. He developed a set of simple but dynamic models of the relationship between the global economy and climate. These tools – called ‘integrated assessment models’ – enable us to simulate the consequences for both economy and climate of the decisions, assumptions and policies made and enacted today. 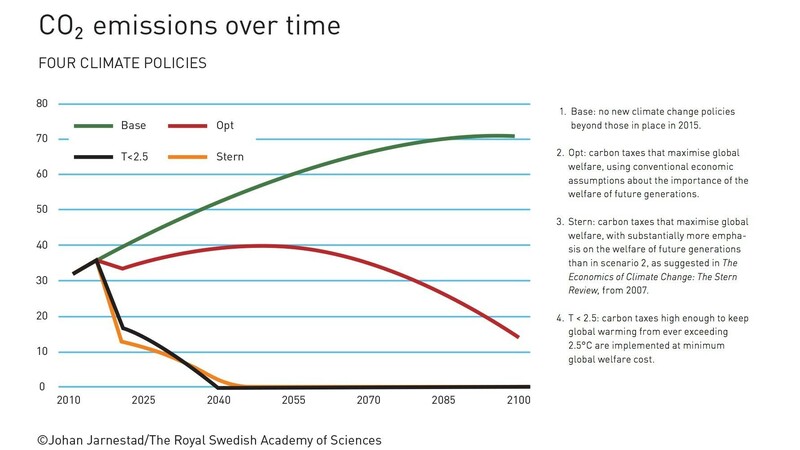 Nordhaus’ work has led him to conclude that the best way to reduce greenhouse gas emissions and mitigate their effects is a globally enforced system of carbon taxes – a course of action is recommended in the IPCC’s report. Romer’s work, meanwhile, has led him to develop a set of ideas called endogenous growth theory. Traditionally, economists have held that a nation’s economic growth is driven largely by external factors – outside investment, for example. But Romer’s theory holds that the opposite is true; that it is internal – or endogenous - factors that hold the key to a country’s prosperity. This is important because it demonstrates to governments and policymakers that sustainable growth is achievable by directing resources and investment internally towards drivers of technological innovation, such as education and research. The contributions of these two economists are “crucial steps forward in addressing central questions about the future of humanity,” the Nobel Committee has said. To move towards a system of sustainable global economic growth, we need to understand the best direction of travel. Romer and Nordhaus have helped to point the way – and their road signs could not be any timelier.